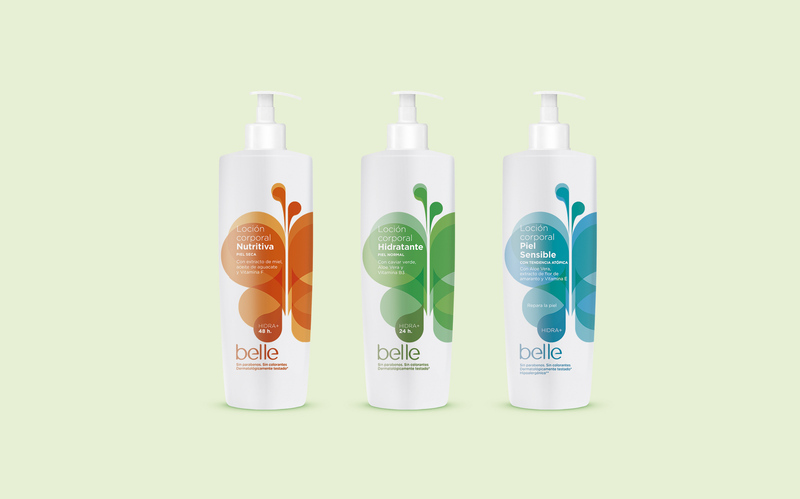 We designed the Belle hydrating creams by tackling the difficult challenge of segmenting and conveying the attributes of this product family. The principal benefit of each product is underscored, and reflecting their properties led us to simplify the graphic expression of their labels to a minimum. Besos de mariposa. Diseñamos las cremas hidrantes belle abordando el difícil reto de segmentar y comunicar los atributos de esta familia de productos. Destacar el beneficio principal de cada una de ellas y recoger sus propiedades nos condujo a simplificar el máximo la expresión gráfica de sus etiquetas.